Completely set up before taking to field and first hunt. Then before the hunt, add natural materials to camouflage the blind and hunters. Use as a Stand-a-lone or as Modular design, by adding blinds to increase hunters. Aligning 2 blinds creates a 4-man blind; Align 3 blinds = 6 hunters. Deadly Duck puts you 'In the ZONE'™! Portable panels with quick connector pins, makes set up fast at ‘O’ Dark thirty. A 2-Man Modular Deadly Duck Blind puts you right where the birds are, every day! May look like a simple design, but the complex angles of the design has proven to be a winner! Tested and proven. The design has no square box shadows and allows for light penetration ( looks natural) fools the birds. This blind has been used at Paul's Ponds, fooling 'em all season long. Featured on DVD Green Heads Galore. Transport panels daily, or pick up and carry. Weighs 55 + pounds, depending upon camouflage. Hunt Success: Right location + Right Hide ( a Maximus Blind) = opportunities for SUCCESS! Quick set up at 'O' dark thirty. Just insert the quick connect pins into the panels. Portable. Transport panels in pick up. Set up and move as needed to adjust to the wind. 3-Way shooting trap door. Leave open and brush up opening, flip out or drop in slow to not flare the birds. Sit in comfortable director chairs(not included), before rising to shoot increases accuracy. Panels are covered with a camo break pattern of EZ-FAB mesh. Just insert natural materials from habitat to become undetected. Use for hunting, videoing or as a play house. Includes: Quick connect pins, nut/bolts package, zip ties and bungee cord for 2 rows on panels to secure camouflage. Ducks Only? Goose hunters have reported success with the new 2-Man Blind too! As seen on DU TV shows. Make your hunt exciting! Watch the birds and know when to call the shot. Easy to see through the mesh. No little parts to loose or fumble with, especially with cold hands.. Panels stack for transport or storage. Fits in full size pick up, or angle in smaller. Enjoy your time in the outdoors. Invest in your success! "Paul's Ponds" uses only Deadly Duck Blinds! See the blinds in action in "Greenheads Galore" 2 hour DVD. "The DD has increased success and hunter satisfaction"!! Says 'honkerguide'...Paul Sullivan, of Burbank Guide Service. Perfect Hide Be in the Zone! Or the HOT spot. Blends right into the natural setting. Use natural materials to attach and insert onto the EZ-FAB mesh. Two men can pickup and move the blinds to fool'em as the wind changes or give them a new look. EZ-FAB Mesh is attached to all panels (poly diamond mesh) when shipped, except the ends to allow the hunter to install the door on desired end. EZ-FAB goes on the out side of frame. This allow for customization of the blinds and to create modular set up. Pre-Cut EZ-FAB included to cover all outside surfaces, along with Zip ties to install the EZ-FAB on the ends. The 3-D effect from natural camo breaks up your silhouette from the outside view. You can watch the birds work from the inside of the blind and know exactly when to call the shot!! EZ-FAB acts as a camo break up pattern. Blind metal is 1/2inch steel, with textured durable powder coat, in flat Dead Grass Color, with EZ-FAB poly mesh in the same flat Dead Grass color. EZ-FAB also has U V additive to extend life. EZ-FAB has a new elongated diamond pattern-easier to insert camo. Includes: All panel frames with EZ-FAB attached to all panels, except the ends. Plus quick connector pins, nuts/bolts package for semi-permanent set-up, 2 end adaptors to allow for pass through, extra zip ties, 50 ft. bungee cord for attaching natural camo and 2 stakes to secure the blind. All panels before camouflage is added weigh 63 pounds. 3 Blinds = 6 or 7 man blind. Door shown open, and trap door dropped inside. Director chairs not included. 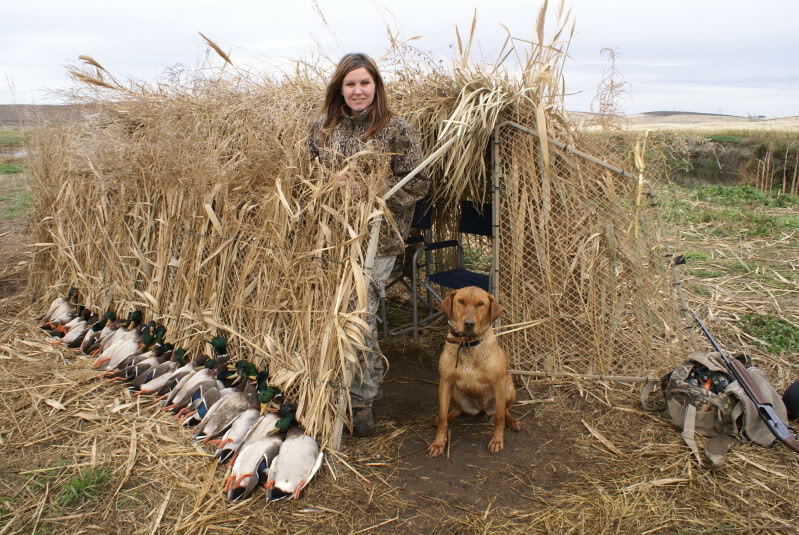 Click here for comparison: the differences between Duck blinds and Goose Blinds? or align 2 blinds together to make a 4 man blind, or align 3 blinds for a 6-Man, and leave the middle ends open (no mesh) to allow for access between the blinds. Interchangeable ends. Decide upon the configuration desired, before installing mesh on ends. Mesh goes on outside. 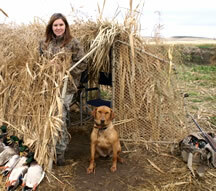 on wary ducks, the Deadly Duck Blind is the answer." All panels are separate, except the trap door which is attached to the front. Put 1 blind right beside the other. Choose option to eliminate the vertical strut, and replace with the L connector, which allows for complete pass through between blinds. Two, 2-Man blinds are easier to transport, than 1 larger 4-man blind, due to size of panels. Access: Modular set up of 2 or more blinds. Just align blinds. Extra nuts/bolts included if hunter wants to permanency attach the panels, instead of using the quick pins. Choose to put doors on opposite ends for more convenient access for hunters/ dogs. For stand-a-alone blinds, use the vertical struts on both ends. Door attached to one end, and add EZ-FAB mesh to completely cover other end. L connectors are used between sections to allow for complete pass through. Doors are on both ends. before natural Camo is added. Success at Paul's Ponds. 6 man after the hunt. White bags are for shell casings/trash. Quiet hinges to not flare the birds. Ease of operation makes the hunt FUN. 1. Leave open (by dropping trap door inside) and brush up the opening with natural materials. Great for early season / uneducated birds. 2. Slowly flip the door out. 3. Quietly & slowly lowering the shooting door inside gives extra precious seconds to rise before shooting.... before the birds realize your presence. Especially helpful for wary birds or slower shooters. Shooting: Practice rising and standing, while taking a step forward before actual shooting sequence. Sit in comfortable chairs while waiting for action. Trap Door:Closes by rotating the latch on top panel, which holds it in place. . Shooting ease, along with location and concealment, is part of the duck hunting success formula. (Along with remaining still/quiet, knowing when to call, decoy set up, etc. Gives visibility while not being seen! But, make sure there is no movement or noise...the ducks will not know you are there! (Motion will make you detectable.) EZ-FAB poly diamond mesh acts like a camo break up pattern; enhance with naturally occurring flora/fauna from hunt site. Just insert or weave into the mesh, attach with zip ties or slip under bungee cord. New elongated diamond pattern enables easier insertion/weaving in of natural materials for camo. 3-Demensional appearance on the outside. Many a duck has been hung in our mesh. Extra zip ties and bungee shipped with blind. Deadly Duck offers options not found elsewhere. Just camo to blend into your setting. Along field edges, along the edge of river/ponds, in fields by hay bales, or ??? Mount on to docks, boats, platforms & ?? Semi-permanent: Nut and bolt package included to replace the quick connector pins. Panels stack for transport. All panels are separate, except the front panel is attached to the trap door due to hinges. NO FLOOR in the blinds. The pictures were taken on a sunny day, which resulted in shadows on the ground. Taller at 55 1/2 inches at the pitch, and wider across the end/door base at 75 inches. Blind is 62 inches long, across the front. Blind before camouflage. No floor. Door open & Trap Door flipped out. Door open and Trap Door dropped in. Access Door: Door opens out, and not inwards. Ends are interchangeable. New interchangeable ends with the modular design. The object is to make the blind resemble a ‘concentration’ of natural occurring vegetation, which does not give shadows like man-made objects. Thus, do not over camouflage. Just enough camo to break up your silhouette. Any motion may be detected, therefore make sure everyone holds perfectly still and restrict noise and wrestling. Attach all materials on the outside of the blind. The desired affect is to create a 3 dimensional surface. When applying camouflage materials, we suggest using natural materials. They are by far superior to any manmade materials. Use the current field materials which are in the area; add fresh camo to old. The only panel where we add grass mats is the top stable panel, to obscure the head pivoting from the birds eye view. Then add some natural materials to the mats on top panel also. Notice that materials can be stuffed or woven into the EZ-FAB mesh, or piled up around the blind. Also materials can be tied on with the bungee cord provided or with zip ties (not included). Each panel has a minimal amount of space around the edge for attaching, lashing or tying on camo materials. This allows the secured materials to not interfere with the other panels when is-assembling. For short distances, just pick up and move. Even moving as little as 75 feet, will make the birds think it is opening day again. Or move to the edge of the field and back when needed, etc. Quick changes are possible with a Deadly Duck Blind! If needed to hide the blind, disassemble the panels and lay them flat. Store in the field or load and transport to the next hunt.. When using the quick connect pins, just remove, stack panel and transport. Best when transporting blind(s) via truck,to place them on a flat surface with largest panels on bottom. Secure or tie the blind down so that it will not bounce or tweak the frame. There are 2 stakes per blind. Blinds with wet camo and/or strong winds, will need the stakes and maybe more in some circumstances. We know! Hook 2 blinds together. The included quick connectors or wire lock pins can go around the frame on two blinds to keep them together. You can use clamps ( not included), or drill some more holes to literally attach firmly together...or your creative solution. Hunt Tips: Best results are obtained when hunters remain still and do not make any noise, especially when the birds are close and overhead. Just like any tool used in the field, you need to practice using it before the hunt. Practice sitting and rising to shoot, operation of the shooting trap door and letting FIDO in an out to retrieve. Teach FIDO to be quiet in the blind, while he waits for his masters command. Maintenance: EACH HUNT: Add and freshen up the camouflage materials often to give the blind the natural appearance which fools the birds! Move the blind as needed, when the birds become wise. You do not have to mover the blind far. As little as 75 feet can fool'em! Just make sure the birds are working the area. Annually: Inspect the zip ties which hold the EZ-FAB mesh before each season and replace as needed. Use black ties with UV additives to increase life span. Spray paint over the black zip ties with flat camo spray paint purchases at local store. Shipping: Aero will research the best rate for you. Most are shipped either Fed Ex small package vs Fed EX truck, but it will vary depending upon location & quantity of blinds..
Extended rural delivery fees and oversize fees will apply. Freight not included, unless stated. Commercial address are always less. Multiple blinds 6+ may be less expensive via truck to business address. Trucks charge extra for home delivery. Aero has special reduced shipping fees with FEDEX, but oversize 1 fees apply. Big box = big results, plus we didn't want a box of tinker toys to show up and frustrate the hunter. The extra shipment expense= saving a whole lot of set up frustration for the hunters. However, once you receive your blind(s), the ease of use and resulting success will make the shipping expense seem trivial. Click Link for the answer! 2-Man Modular Blind is only 4 inches high, when flat! Blind shown to the right, is just removed from box.. Completely assemble and first set up before taking to field for first hunt. Then before the hunt, allow time to add natural materials to camouflage the blind. Plan on 2-3 hours for first time assembly from box, then about 1/2 the time for the second. A helper expedites the set up. Secure the suggested tools. The front, trap door, top and back are pre-assembled with EZ-FAB mesh, but the frame is cut in 1/2 for shipping and folded. Must attach the connector plates with 4 screws/nuts on top and bottom of all folded panels in center to return to full size. Try to place the lip of the connector plate on the bottom. Note the span with the trap door latch is heavier steel tubing for support, with the section connector plate already attached. The bag with one 3 longer screws and bolts are only for this location, beside the twist door latch. Make sure the connector does not interfer with the latch. When assembling the ends, one side has numbered pieces to match and the other has letters. Best to assemble the door end first with the hinges. Then assemble the other end, matching the shape of the door end. Do not attach the mesh until you know which side is outside, by standing the blind pieces up and inserting the 2 quick pins in each end in the pre-drilled holes. Remove the ends and attached the pre-cut EZ-FAB pieces by laying flat over the blind frames on the outside. Secure with zip ties to one side, then smooth the mesh over to the other side until almost taunt, but not tight or stretched, and secure the mesh to the frame with provided zip ties. The zip ties tails go to the outside of the frame. Trim the ties when fully attached with snipes. Can burn any sharp edges on the ties and mesh, to not scratch the hunters or hang up on clothes. If aligning multiple blinds change the ends before installing the mesh and switch the door hinges to outside of blind. ( 4-man should have doors on each end. 6-man has same doors set up, but add a center blind with no mesh on either side and access door is removed. Need a 10 mm box wrench, 1/4" drive adaptor for power drill or screwdriver, 10mm sockets with 1/4" drive, strong HD scissors or snipers/tin snips trim the EZ-FAB and zip ties. The EZ-FAB mesh is oversized to allow hunter to trim as needed. Mesh needs to cover the frame, for break-up and to allow the camoto be inserted, to cover metal. Trim mesh as needed to allow the doors to work. Pass on our hunting heritage to your family & friends. Take a youth & share the sport. & REMOVE ALL LITTER YOU SEE.